If you didn’t move as fast as some when it came to the new 19-registration plated vehicles that hit the showroom at the start of March, there are still many deals out there to mull over. This week we’re casting our eye over some of the new models from the great German manufacturers. 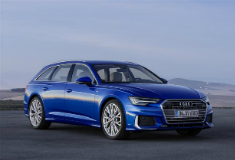 Audi’s range continues to expand, with the latest generation A6 saloon and Avant models claiming to take autonomous driving to the next level. Executives looking for an extra dash of style meanwhile, are being targeted by the new second generation A7 Sportback that’s a smarter, more unique option. There’s an all-new A1 Sportback model too, a revised version of the TT sports car and an all-new second-generation version of the Q3 compact SUV. ONE TO WATCH: The new Q3 is now cleverer, smarter and more efficient, all of these being attributes it'll need if it's to make headway in this increasingly crowded segment. The key news for BMW dealers in recent months has been the launch of a second-generation version of the company’s mid-sized X4 SUV Coupe. There’s also a fresh lifestyle-orientated option for Executive segment buyers in the form of the new 6 Series Gran Turismo model. In other news, the company has revised its i3 electric range and added a sporty i3s variant, and there’s a new M5 high-performance sports saloon, a ‘Competition’ version of the M2 coupe. ONE TO WATCH: The X4 is a far more competitive, mid-sized premium-badged SUV-Coupe than its predecessor. Mercedes has been busy of late, following a flurry of new model activity which brought us its revised E-Class range with new Plug-in petrol and diesel variants, and substantially revised C-Class models. There’s also a new generation version of the Mercedes-AMG GT four-door model. Then there is the MK2 model of the Mercedes GLE is a large luxury SUV with a more dynamic look and a more sophisticated feel than its M-Class-based predecessor. If you want something a little smaller but more stylish, there’s a new generation of the Mercedes CLA four-door coupe. ONE TO WATCH: Mercedes hopes that its new third-generation B-Class in the mid-sized MPV segment will fit the bill for families. Porsche has introduced a stylish ‘Sport Turismo’ estate version of its second-generation Panamera luxury five-door model. Even more significant for the brand though is the all-new third-generation version of its Cayenne large luxury SUV. This shares the same ‘MLB evo’ platform used in the Bentley Bentayga and the Audi Q7 but offers sportier handling. ONE TO WATCH: The Cayenne now features much more appealing styling. Volkswagen has just launched a new generation version of its Touareg luxury SUV. This follows a busy year, which has seen the brand introduce its new T-Roc mid-sized SUV, its 7-seat Tiguan Allspace and the all-new sixth generation version of the Polo supermini. There’s a hot GTI version of the up! City car too. ONE TO WATCH: The new T-Cross is coming soon. Featuring the latest car tech perfect for adventures in the city and countryside, It's compact, versatile and dynamic.